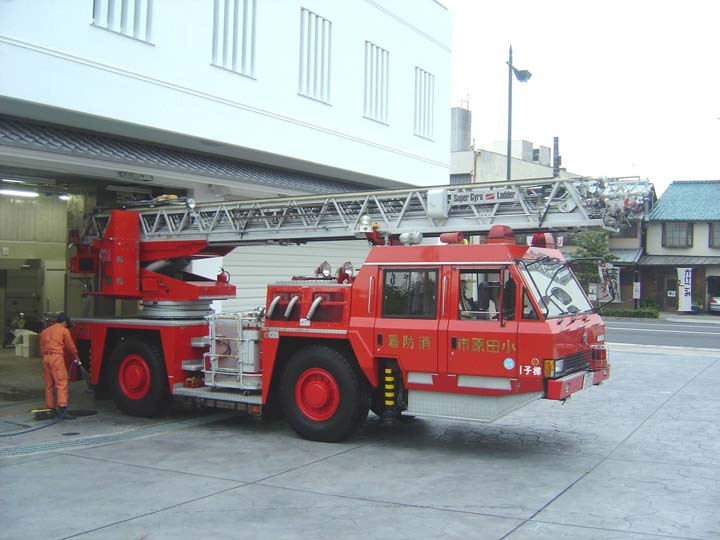 Gee - that looks like your basic "Cherry Picker" crane - 4x4 balloon-tire chassis, with the 4-man cab hung on, in front. Given the limited suspension travel (if any) in those wheel arches, the short wheel-base on those bouncy balloon tires and that terrific overhang - the crew up forward must have quite an interesting ride, at any kind of speed. Obviously thought up for densely-populated, multi-storey units located on steep grades, in the mountainous terrain. Don't think it does much racing along an Interstate Highway/ Motorway ! Thanks, Jacques, for showing us another uniquely interesting rig. Added by Pat Rivers-Bowerman on 20 December 2008. Toy Company Takara Tomy had produced a model based on this appliances. Added by Bomba Boy on 22 December 2008.
the front and rear wheels, aft of the engine comp't - and, if so, how do you hook it on - lift it out, by man-power ? Added by Pat Rivers-Bowerman on 24 December 2008. Added by Sugath on 25 February 2016.